My boss gave me some yamamomo (myrica rubra or Japanese bayberry?) yesterday. 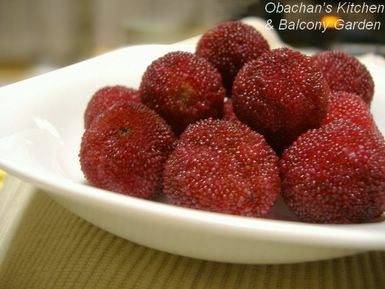 This fruit is very popular in Kochi and used in various ways including desserts, jam and liquor. In my hometown, it is popular to make yamamomo-shu in the same way they make ume-shu (plum liquor), which is soaking the fruit and crystallized sugar in “white liquor” in a jar and waiting for about two months. Compared to ume-shu, yamamomo-shu has somewhat sweeter fragrance and a more pinkish color, and I like it mixed with some water and lots of ice. 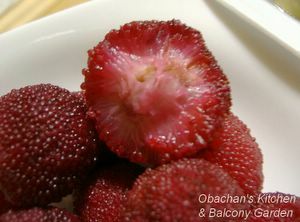 The left photo shows the inside of a yamamomo berry. I like eating yamamomo raw, too, with a little salt sprinkled on, but very ripe ones only. They are quite sour and even a bit astringent when not ripe, and eating such unripe ones can be unpleasant enough to make you want to stay away from them for the rest of your life. My boss gave me ripe and juicy ones (thanks, boss!) I enjoyed them after supper tonight , watching TV. I never seen any one like this before but I'm so jealous of you..thanks for sharing! i know i don't post comments often, but i was wondering if you had any recipes for some simple miso dressings? something simple but really tasty? You are very honorable. Go well, my friend. Thanks Obachan! I have seen them in the supermarket here, and wondered what on earth they were, and what do you do with them! Now I know. Thanks. Yeah, I’m happy with the way the photos turned out. About the miso dressing, how about this recipe for sumiso dressing that I posted long time ago? Sumiso is good with blanched vegetable and seafood (like boiled squid or octopus). You can add a little mustard for an extra kick. I guess yamamomo trees do not grow in the northern part of Japan, so it’s no surprise that you haven’t heard of this berry. It’s kinda funny that it is called “momo” even though it doesn’t look or taste like peach at all. Oh, they have yamamomo in Osaka? I thought they were available in Shikoku and Kyushu only. Thanks for letting me know. Actually, I wondered after I posted that post about whether or not I actually did see them in the supermarket. I think that maybe I saw them at a restaurant, which may have ordered them, if you say they are only available in Shikoku and Kyushu. But I am pretty sure that it was here that I saw them. I will ahve to have a look at some of my food photos! you are so lucky to get it fresh! I've only had it as a preserved fruit when I was a kid. I think it was from China. I like the texture of it. What I said was nothing more than my assumption, so it can be wrong. Yamamomo may be available at supermarkets in Osaka, because the Japanese site I just found said that yamamomo trees can grow even in Kanto area. hi obachan, i just enjoyed some yamamomo recently and am bemoaning the fact that they are so exorbitantly priced in singapore, plus the specimens we get don't look as spectacular as yours! Thank you for your web page, it is very informative. Tonight I was going to a Kaiseki dinner at a nearby Japanese restaurant (http://www.kaygetsu.com) and I wanted to learn what a yamamomo berry was. You answered my question perfectly! Have a nice day. i saw these fruits growing in some shrubery that were landscaped into the new building across the street (in Nakano-ku), it took a few years before it produced fruit but now I wish I had picked them. Next year!